Future-ish: Chipotle's "Back to the Start"
A recent TV ad by everyone's favorite sustainable fast food burrito chain, Chipotle, has created quite a stir. Some say it upstaged the Grammy Awards during which it aired and it has now won several awards. 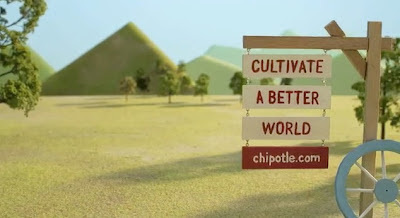 The ad/short film, produced by Creative Artists Agency and Nexus Productions and directed by filmmaker Johnny Kelly, Back to the Start, supports Chipotle's long running position on developing a sustainable food system. As an animated farmer learns about the gritty details of industrial farming, Willie Nelson covers Coldplay's tune The Scientist, the perfect soundtrack to make the spot hit home all the more. "it says that you can sell and have a social message, that's kind of what advertising is going towards right now". We agree on all fronts, sometimes shaping the future does require going back to the start...to do things right from the beginning.